Rose Breasted Grosbeak - This bird has such striking colours! We've lived here for a year and this is the first time we've seen this bird. There were two at the feeder at the same time! Is this bird native to southern Ontario, or is this yet another sign of global warming? Hello Kristina - Southern Ontario is part of the breeding range of this bird, although they spend their winters in Central America and the Caribbean. I found a picture and a short YouTube video of this bird. I live in St. George, Ontario, (just north of Brantford) and first saw the grosbeak back in May when he visited our feeder daily for about a week. This has happened a few times in previous years and then he disappears. I was happily surprised to see him back at the feeder twice in the last few days. Beautiful bird! Sighted male in Guelph this morning at my feeder, first ever! Saw one the other day in St. Thomas Ontario. I saw one today - just northwest of Ayr, Ontario. Lots of Baltimore Orioles around this but this bird had no orange just the red chest and striking white bars on black wings. I looked it up and found this site too. Sorry no pic. Just had one on my birdfeeder as well in Brantford, Ontario. I had never seen this bird before! Just spotting one this morning, flying between our feeders and trees. What a striking bird. Had to look him up and discovered this site. Couldn't get a pic either. Just had one at my feeders for the first time in Brantford. What a pretty bird. Such a treat!! Mulmur, Ontario (north of Orangeville). We had a Rose Breasted Grosbeak visit us this morning. He was sitting quietly on a bare ginko tree branch while I sipped my coffee. I'm hoping he has a mate somewhere nearby and will stick around. Was totally shocked to see this beautiful bird on my tree outside my living room window. Lived in Brampton for 40 years and this is the first time seeing one. I have a feeder on my window, he seemed kind of timid at first, but finally landed on the top of it and chose to eat the seeds on the ground, eventually another male came by. Their beauty is unbelievable. What a gift we were given.... it's going to be a beautiful summer. First time we have seen these birds in our backyard. We had a beautiful Rose-breasted Grosbeak in our feeder this morning. They sing a lovely song too! Just saw one at my feeder. I just observed one at my feeder in Cambridge. First Rose-breasted Grosbeak at my feeder this morning at it isn't even May yet .... so excited!! Red breasted Grosbeak just landed at our feeder. North Etobicoke. Feversham, Ontario - Have one come in occasionally following a female Baltimore Oriole to its feeder. Only time I see it is like this. Why is it following the Oriole? I had a pair of these at my feeder this morning. First time for me. I hope they come back. We have been here for decades but today was our first sighting of this beautiful bird. We have 4 of them at our feeder today. They stop by for a couple of days every year. We are just outside of Fort Frances, Ontario. We have one in Haliburton, Ontario. Safari. Like so many comments before, we have lived on our rural property for 17 years and saw the male at our feeder (small sunflower & safflower) for the first time this morning. His triangular red bib is so striking! Plumage is quite striking. We live in the Village of Appleton, west of Ottawa. I saw 2 today at our backyard feeders, Iroquois, (Eastern Ontario). I've never seen such a stunning color contrast as this bird has! My first time seeing one today on my bird feeder, I hope I see more of them this summer. I'm in Brechin by lake Simcoe and have an extensive forest with lots of bird life. Hello - I have 4 Rose Breasted at my feeders. What a Beautiful Bird indeed! I tell them apart by their marking. This is the first time I have seen them in Gilmour, Ontario, Canada. I did not see any last year and am so Happy they came this year. They have been here for a month and are eating very well. What a great bird. They seem to be loners and do like to eat alone or I should say the other birds were unsure of them, but everyone is getting along now and eat together and come in one at a time. I have feeders outside my front room window and watch them every day What a WONDER IT IS TO SEE !!! We have 4 feeding on our deck in Barrie, Ontario. A very pretty bird who has found our black oil sunflower feeder. Really pretty bird. First time we have seen these beautiful birds. Two have been at our feeder all week now in May here in south Burlington, Ontario. We have lived here 24 years in our home in London, Ontario. This is our first Grossbeak. Such vivid red (sort of like an upside down slingshot) on its chest, deep black head and yellow beak. For sure a juvenile. Hope to see more! We have been feeding birds here in Stoney Creek, Ontario for two years. Today I saw one of these stunning birds for the first time, trying to eat from a tube feeder we have set up for the finches. What a gorgeous bird, not just when it's sitting, but also when it's flying! I hope it keeps coming back. Had a pair visit my feeder in Millbrook, Ontario. Stunning colours. I just had this beautiful bird come to my feeder for the first time, never seen one before, he stayed and ate for quite awhile. I have lived in Welland Ontario all my life and never saw this bird, what a treat, I hope it comes back. My in laws have these birds come to their feeder frequently. Good to know what they are called. First time ever seeing this bird! Gorgeous! Little Britain Ontario. Hope we continue to see them. We had a baby Rose Breasted Grosbeak fly into a window this morning. It was quite stunned, and just sat under a bush near the window for a good 45 minutes. We even went outside and had a look at it and it didn't budge. Then we looked out again and it was gone. Upon further investigation we noticed it was up in the bush. Then about 30 minutes later we went out to check on it again, and we startled it and it flew away - favouring it's left wing. But at least it flew and hopefully it's doing fine now. Have seen this gorgeous bird visit our backyard in Markham the last couple of days. Today it came by for one last feed of sunflower seeds from the feeder at 7.45 pm. First sighting of this beautiful bird in the Blue Mountains yesterday! Seen one at the feeder for about a week - Campbellford, Ontario. A new visitor to my Ripley bird feeder this morning-a gorgeous Rose Breasted Grosbeak! Wow! A first! There is one that has been visiting our backyard in London, Ontario. Saw one at my feeder. A real beauty, first one I have seen in 10 years in Newmarket, Ontario. We have had 2 males coming to the feeders regularly for about 3 weeks. Have lived here for 17 yrs and only seen this bird twice. Now it's multiple times a day. Awesome!!!!!! We have a pair of these beautiful birds came here on Saturday May 14 2016. First time we saw them here in Beautiful downtown Sprucedale, Ontario. Just had one visit my feeder here in south Ajax, Ontario by the lake. Beautiful bird - first time I've seen one! At my mother's feeder in London. I've never seen these before. Lovely! And as I write I see a bird I do not recognize, wth? We saw a pair of these birds this afternoon here in Pike Bay on the Bruce Peninsula. They were at a feeder enjoying the mixed seeds. Just saw one at our bird-feeder in Orangeville, Ontario. I have never seen one before ... what a beautiful bird! Just seen two of them at my feeder, this is the first time I have seen them, lots of colour, hoping they come again to visit my feeder in Strathroy. May 10, 2016 we are in Hamilton, Ontario just a block below the escarpment. Both male and female have been coming to our bird feeders for the past week. May 10, 2016 - I saw a Rose Crested Grosbeak on the deck rail eating birdseed. Looked very healthy! There is actually a pair at my feeders today! The female looks like an overgrown finch with brown colorings, nothing as spectacular as the male. I live in Grimsby, Ontario. We have lots of birds in our yard just outside of Guelph, Ontario, but this is the first time we have seen a Rose Breasted Grosbeak. We also have a very large number of yellow finches this Spring. They seem to enjoy the bird seed this year from Costco! I had a male Rose Breasted Grosbeak then a female at my feeder today in Oakville, Ontario. Saw them last year for the first time. May 9 - first time spotting! I had one of these at my feeder this morning! He/she was beautiful! Got several pics before it flew away. Wow! First time seeing in my life - so exciting! Welcome! Just spotted my first red breasted grosbeak this morning. They have arrived back for the season. I love these birds! We have one at our bird feeder today in Welland, Ontario - nice bird, eats lots! Just saw a Rose Breasted Grosbeak! Saw one for the first time ever this morning in Downtown Toronto on my suet feeder. What an eye-catcher! Gorgeous!! There is one in my feeder today, never seen one before here. I live in St Thomas, Ontario. Your webmistress, Barb, here - I also live in St Thomas, and have never seen one! I hope the one you saw comes to my feeder too! My wife and I have lived here for 16 years and this is the first time spotting one in our mulberry tree, along with three cedar waxwings. Had one sitting on my window sill for a good 15 minutes in Thunder Bay, Ontario ..... first time I have seen one as well, very cute! 3 pairs at my feeder today along with 2 pairs of orioles .... A great birding season so far. 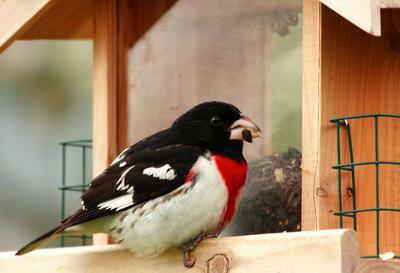 I love the Grosbeaks as they will just sit on the feeder and crunch away. They are not skittish like the Orioles who love grape jelly. I saw one for the first time in twenty years, this spring, the next day there were two, constantly at the feeder, they did not seem to be afraid of us at all, then there were five, and we realized they were the babies! They came right into the gazebo and would swing on the chandelier like parrots! So delightful. Then they were gone, I hope they come back next year. We saw our first Rose Breasted Grosbeak at our feeder in Mid August, we have never seen one on our feeders before, we live in Willow Beach, just outside of Sutton Ontario. He hung around for about 5 days, then he was gone, but while he was here he pretty much took over one of our feeders, even the blue jays couldn't scare him off. I had never seen a Rose Breasted Grosbeak until today. A beautiful male kept flying quite close to my picture window. I was so afraid he would hurt himself. I grabbed the camera but of course he's nowhere to been seen now. Sure hope he comes back. I live in the Keene/Hastings area. First time seeing one here just north of Sudbury, Ontario. I know he must be lost this far north. We get these "cut throat" grosbeaks every spring. They love oil sunflowers. I got a video a couple days ago of a male Oriole and male Grosbeak fighting at our Window feeder (The Oriole successfully defended it). We are in Finch, Ontario. First time seeing one in our backyard. We have been here for 4 years. St. Catharines. We live north of Huntsville and have them here. Seen for the first time this year. This is the first time I have seen these birds! There are two males and what I believe is one female at my little backyard feeder right now. They have been eating voraciously for nearly an hour. Hope they continue to return! I am about 10km north of Stouffville in the hamlet of Ballantrae. What a cool bird. First time I have seen one. Peterborough, Ontario. I have never seen one of these birds before. We live in Wasaga Beach, Ontario, and unfortunately my daughter found this little guy deceased in our back yard. What a beautiful bird though. The markings are absolutely gorgeous . For the last couple of days we have had 2 Rose-breasted Grosbeaks feeding at our sunflower seed feeder near Manilla, Ontario. This is the 1st time that we have seen them here. They are such a pretty bird. Kingston, Ontario - Couldn't miss this beauty at the backyard feeder -identified him through your site - thanks! Joined by what would appear (similar face and wing markings but no red throat) to be his mate. Our neighbour has many outdoor cats, so I hope they decide to hang around. We're especially pleased when anything other than starlings visit! We have several of the birds at our feeder and in the yard. I do not know their nesting habits. They do not seem to be moving on. Just watched two Rose Breasted Grosbeaks in my yard at the feeder. My grand-daughter spotted this bird in our back yard yesterday, southeast Scarborough (Toronto) and as it turned out there were three of them. We often bird watch and the small book we had did not list them. Thanks for the information as this is the first year we've seen them around here. I have a feeder on my deck and I have a regular Rose Breasted Grosbeak visiting. I'm a little far north in New Liskeard, Ontario, and wondered if it's uncommon for them to be this far north. Rose Breasted Grosbeak seen at our backyard feeder today - feeding on sunflower seeds. Sharing the feeder with cardinals, house finches and goldfinches. Thanks for your website, first time I have ever seen this bird. It is eating at the bird feeder. 4 years ago a Rose Breasted Grosbeak hit our window and hurt its wing. He is doing very well. He loves my Mom and also says "Pretty Bird". He eats seed and fruit & veggies. He sings a lot (and loud). Does anyone know how long these birds live? Thanks. Wow, I didn't know that they would survive in captivity. Sorry, I don't know how long they live, but perhaps one of our readers may know. I have lived here since 1992 and have bird feeders in living room window - the first time ever seen just outside Spencerville, Ontario. Only has been coming to feeder for 3 days now, only one so far, and I got some nice pictures! Just saw one at the sunflower feeder ... in Oakville, Ontario. The first time I have ever seen one! I spotted this perched outside the window and got a very good shot of it. I knew the name, but had never seen one. Sharbot Lake Ontario. Have very many different types of birds that come to our feeders. This is the first time that we have seen the Rose Breasted Grosbeak. There are a pair of them, hope they find our feeders satisfactory so they will stay around. Beautiful bird. I have lived in this house for 5 years, always having feeders. Today, I have seen two of these birds..... it made my day. We have a homemade feeder in our yard in Paris, Ontario, and we spotted a pair of Rose Breasted Grosbeaks there this morning - we put out sunflower seeds and they love them ! I have several Grosbeak that feed in my back yard daily. This is the second year they have been coming to my feeders and this morning I was late putting out the feeders and the Grosbeak came to my patio, perched on the back of the chair and looked the sliding glass door at me while his lady friend waited on the fence. I managed to get two pictures of him which I can send via e-mail if I can get an address. I live in Innisfil by lake Simcoe so I have a plethora of wildlife passing by my window daily. Hi Ruth - thanks for the info, you can send your pictures to us by completing the form on our Backyard Birds page, where it says "Enter your Title". If you send your pictures, I will add this report to them. I saw this bird early in the morning on the fence in my backyard. Never seen one before and had to "Google" it immediately. We live in Cobourg, Ontario, and we see a large variety of birds in our yard as we live next to an open grassy field and woods. Very interesting to say the least. What type of seeding does this beautiful bird prefer to eat? I'm not sure what they eat - probably an assortment of seeds, maybe one of our readers will know! Saw one in Pickering, Ontario in June 2011. Just saw our very first one June 10/11, at our feeder in Johnstown, Ontario. What a beautiful sight, hope it come back. Seen one for the first time in Johnstown Ontario, what a beautiful bird. Just saw a beautiful male Rose Breasted Grosbeak at our feeder, just south of Peterborough. First one we have ever seen, very striking. Just spotted one at our feeder this morning here in Hawkesbury, Ontario. What a handsome sight! Yesterday, May 16th 2011, first time ever seeing these birds. Have two males and two females. Even in the rain today the 17th, they are coming to feeder. Awesome colours. Schomberg, Ontario. Been here 15 years this is the first time we have seen this bird at our feeder. This is also the first time we have seen this beauty. It is everything that the other people who posted said it was (colourful and not shy or skittish with people or other backyard birds). Perhaps these migratory birds have chosen a slightly different path this year, due to the wet weather we have been experiencing here and in Manitoba. Just spotted one at my feeder in Kitchener-Waterloo. Aurora, Ontario - I've been living here for 20 years and this is their first visit to the feeders. One male and one female. What a joy! We had our first visit here on Wendigo Lake in Northern Ontario, from this bright coloured fellow only a couple days ago. Had to look him up on this site. We knew he was some kind of Grosbeak. We have an adult male here at our feeder, but it's the first year we've ever seen one. Are they typically known to be in Nova Scotia? Hello there in Atlantic Canada! According to the website All About Birds, Nova Scotia is part of the summer breeding ground of the Rose Breasted Grosbeak, so perhaps you will see more of them. I feed the local birds here in Belle River, Ontario, they congregate on the ground below my apartment balcony and this is the first time I have ever seen one of these beautiful birds. My wife saw the female a couple of days ago and I saw the male yesterday, he complimented me by coming up on my balcony to investigate and eat some seeds that had fallen out of my container. We just spotted one this morning in our backyard in Brampton, and decided to look it up, because we've never seen one here before this morning. Hi, We just saw the Rose Breasted Grosbeak on the 6th and 7th of May and we have never seen one before. What a beautiful bird! We have lived here all our lives and we've just seen it now. What a nice surprise it was. I had 11 male Rose Breated Grosbeaks in my yard on May 6th of this year (2100). If you want to see some video, type in ve3tmg on YouTube. I live in Windsor, Ontario. I live in Chatham and just had one at my feeder also. This is the first time I have seen one here. Very neat! Saw this bird tonight in London Ontario at our feeder. Been in London 17 years and this is the first sighting. Remarkable looking bird and not shy - I was able to get pretty close and took some pictures. Just saw two at feeder in Waterloo, Ontario. Just saw a Rose Breasted Grosbeak in Brighton, Ontario. Are these birds common to this area? Hello. Yes they are the most colorful and wonderful bird. We live in Tobermory and they arrive every year in May.Usually travel with the Orioles. they feed here for about 2 weeks then leave. The males usually arrive a few days before the females who are a brown color. So hopefully you will see them again next spring now that they have been to your feeders. Enjoy them they are so beautiful.